Award-winning comics creator and author of the bestselling Invisible Emmie Terri Libenson returns with a companion graphic novel that captures the drama, angst, and humor of middle-school life. Perfect for fans of Raina Telgemeier, Jennifer Holm, and Victoria Jamieson. Middle school is all about labels. Izzy is the dreamer. There’s nothing Izzy loves more than acting in skits and making up funny stories. The downside? She can never quite focus enough to get her schoolwork done. Bri is the brain. But she wants people to see there’s more to her than just a report card full of As. At the same time, she wishes her mom would accept her the way she is and stop bugging her to “break out of her shell” and join drama club. The girls’ lives converge in unexpected ways on the day of a school talent show, which turns out to be even more dramatic than either Bri or Izzy could have imagined. 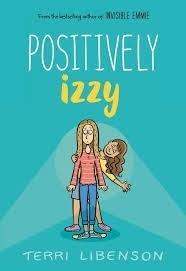 'Positively Izzy' by Terri Libenson included dual viewpoints by two characters, both of whom were dealing with their own issues and insecurities over the school talent show. Izzy and Brianna are two girls who have very different personalities and sensibilities. While Izzy loves taking part in drama club and preparing for the talent show, she is not nearly as focused on her schoolwork, much to her mother's and older sister's chagrin. Brianna, on the other hand, is studious enough for herself and Izzy, claiming at times that she'd rather be home working on homework than getting roped into the talent show by her mother, who just so happens to be the drama club teacher. Izzy's and Brianna's paths hardly cross in the story, which seemed a bit strange and somewhat confusing throughout, but the reasoning behind this becomes more than clear by the novel's end, and readers can go back and see how all of the ideas come together. The relationship between the two girls is an interesting one, brought about by dynamics that neither of them could have necessarily predicted. Despite their differences, they find ways to forge a common ground as a means of enjoying a stronger bond with each other. Family and friends are also very important to both girls, showing that they are more similar than they might think. An intriguing and sweet read about the dynamics of relationships and finding new ways to put oneself out there and find new ways of enjoying oneself, 'Positively Izzy' is a fun middle-grade novel, and the illustrations will only heighten the reading experience.